The VVV survey (VISTA Variables in the Via Lactea) of the VISTA telescope at ESO’s Paranal Observatory in Chile has allowed astronomers to see the central parts of the Milky Way as never before. Using infrared light, the VVV imaged the Trifid Nebula and revealed that the gas cloud has been hiding two Cepheid variable stars directly behind it but at a far distance. The pair of cepheid stars hidden by the Trifid Nebula is estimated to be around 37,000 light years away from Earth while the Trifid Nebula is at 5,200 light years away. Cepheid variables are unstable bright stars that brightens and fades over time, in this case, a period of 11 days. These two stars are the only two known Cepheid variables that are close to the central plane of the Milky Way which is 27,000 light years away from Earth. 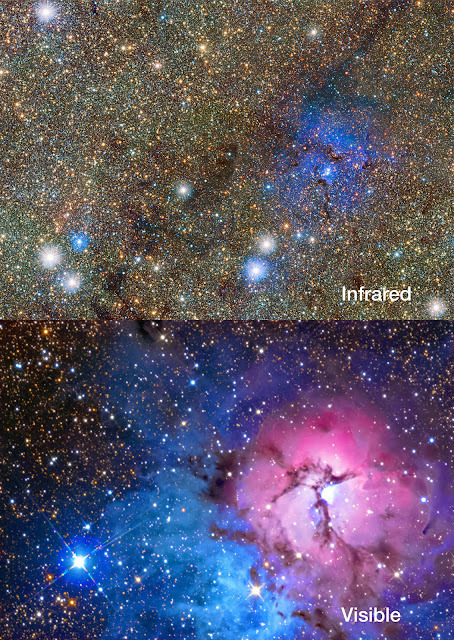 A new image taken with ESO’s VISTA survey telescope reveals the famous Trifid Nebula in a new and ghostly light. By observing in infrared light, astronomers can see right through the dust-filled central parts of the Milky Way and spot many previously hidden objects. In just this tiny part of one of the VISTA surveys, astronomers have discovered two unknown and very distant Cepheid variable stars that lie almost directly behind the Trifid. They are the first such stars found that lie in the central plane of the Milky Way beyond its central bulge. The familiar pictures of the Trifid show it in visible light, where it glows brightly in both the pink emission from ionised hydrogen and the blue haze of scattered light from hot young stars. Huge clouds of light-absorbing dust are also prominent. But the view in the VISTA infrared picture is very different. The nebula is just a ghost of its usual visible-light self. The dust clouds are far less prominent and the bright glow from the hydrogen clouds is barely visible at all. The three-part structure is almost invisible.